Do not touch without gloves. Skin irritant. Avoid contact with eyes. Wash hands thoroughly after preparation to avoid irritation. Why not try Pickling chillies in vinegar, with a few coriander seeds, peppercorns and bay leaves. Good to know For less heat, remove the seeds before cooking. 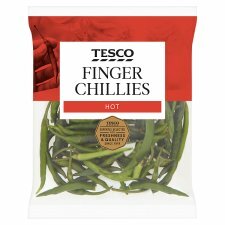 Leftover chillies can be frozen for up to one month. Easy to chop from frozen. Preparation Guidelines: Warning Do not touch without gloves. Skin irritant. Avoid contact with eyes. Wash hands thoroughly after preparation to avoid irritation.